I wanted to give you an idea of how you can use your money to put on a very elegant event at any budget. In each budget, I have budgeted for 150 guests. As you know, each couple has their priorities, which you can account for in your own budgets. 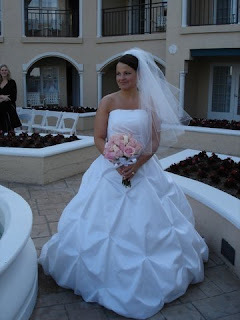 To give you a guide, generally, the reception portion will take up about 50% of your budget. I include food, table chairs, service, site fees, tent, etc. 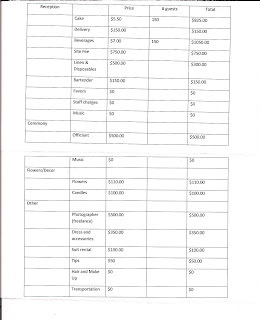 As you can see, you can plan a very nice wedding on a 5K budget, but you have to be realistic with what you will get. Sample budgets are below. Click on them to make them larger. ...you can almost hear the joyful laughter. 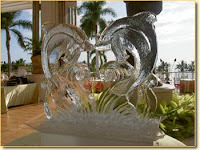 Ice Sculptures: Yay or Nay? Some of you will be too young to remember this. 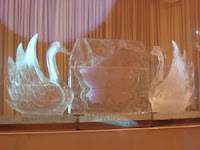 But when I was a girl in the eighties, I can recall ice sculptures being at many of the weddings I attended. Yes, they did melt. That's the one thing you can count on with ice. But for a couple of shining hours they were works of art. Many times they were in the shape of simple swans, other times they were majestic. 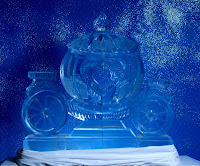 For a time, ice sculptures fell out of fashion but now they appear to be back in a big way. Not only are some brides-to-be shelling out money for custom-made ice sculptures, but others are breaking the mold (pun intended) by creating their own. But what do you think? Are ice sculptures worth it? 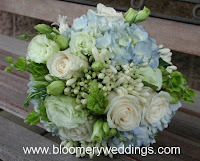 Having a white bridal bouquet could be a great way to add another layer of elegance to a formal theme. Contrary to what you might think at first, having a white bouquet isn't limiting. Instead it opens up new ways to go wild! For example, choose from one of the many shades of white - stark white, eggshell, ivory, or cream - or mix them up. Add exotic greenery, leafy foliage or other botanical touches. Accent your bouquet with non-floral accessories such as feathers, faux pearls, and ribbons. 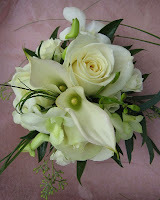 Some popular flowers for white wedding bouquets are orchids, roses, calla lily, lily of the valley, anemones, white tiger lily, gladiolus, gardenia, stephanotis and freesia. I find many couples are extremely unrealistic about what they can get for the money that they have to spend. 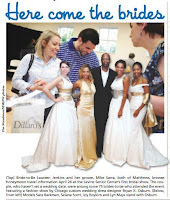 Wedding magazines and the internet may be to blame for some of their views. 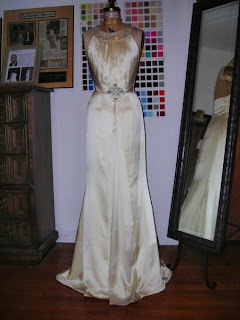 Brides-to-be feverishly clip or download pictures from magazines or the internet, and choose very beautiful things. But when they come to me, and tell me that they have a 10K budget with 100 people, then we have a problem. Don't get me wrong- I am all about the fairytale and I want to give couples what they want. But, it's also important to give them them a realistic alternative that they will love as well. If I encourage them to live a financial fantasy, no one will be happy in the end. So, I will review what you should budget for different items. Of course, different areas of the country will differ, but this will give you a general idea. Reception – 50% of your costs, this will be the largest chunk of money. 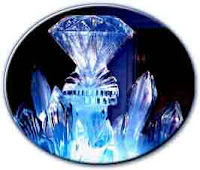 I include the site, food, beverage, tables, chairs, linens, silver, glassware, flatware, service charges, tax and gratuity. 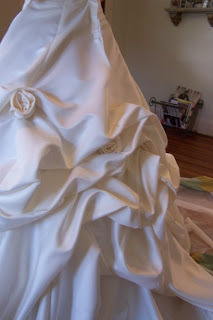 I do not include any of the décor in this cost (flowers, lighting, draping or other decoration items). If you are getting married at a hotel, banquet hall, or other wedding facility which has an in-house caterer, the price per person will most likely include food and beverage. It will almost certainly contain tables and chairs, basic linen, napkin and all of the basic flatware and china options. It might also cover the cake. 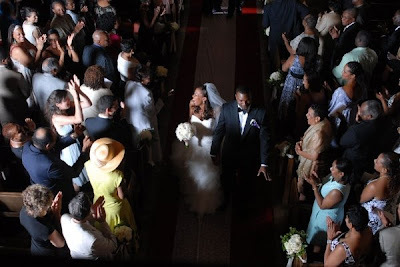 Often, these types of venues offer 3 or 4 menus; with the differences being more expensive food items, additional upgrades (wine service at the table, international coffee station), passed hors d’oeurvres, more options of linens, upgraded cake and/or bar options, or lengths of open bar, and the like. Of course tax, tip and service charges are added, and in the DC area, those charges could add an additional 25%. So when you create your budget, make sure that you are breaking up all these different items. Do not forget delivery fees. And be wary, if you see a flat per person price. Make sure you note what is and what isn't included. Ceremony – you have to budget for the site or room fee, officant fee, church donation (mandatory or otherwise), and any musicians fees. 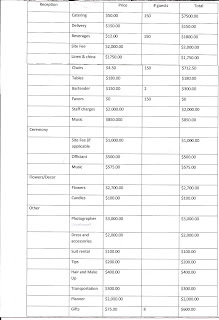 Ceremony fees are variable, and I have seen them go as high as $2,500.00. The price depends upon where you are having your ceremony, whether you are getting married in a church, and whther you are a parishioner. If your ceremony site is at the same location as your reception, you might have a bit more leverage in negotiating the ceremony site fee. There is always a cost savings advantage when you have your ceremony and reception in the same location (travel, transportation costs, delivery fees, time, etc). When you compare different photographers, make sure you compare apples to apples. One photography package may include an album, DVD of hi-res images, 2 parent albums, and 8 hours of wedding day coverage, while another package just might include the 8 hours of wedding coverage. Remember that photography is an art. Much of what you are paying is for the photographer’s “eye”. This is very important, because this is how your wedding will be documented for all time. Flowers and Décor-I think this is the area where the sticker shock strikes hardest. 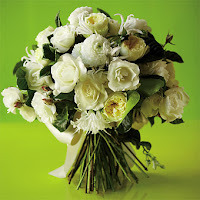 Many of our couples cannot believe the cost of flowers. I’ve said it before, and I’ll say it again, floral designers are worth their weight in gold. I tell our couples to buy a few blossoms (hydrangea, lilies, curly willow and roses) and arrange them. Then, compare their arrangements to that of a professional designer. Ladies and gentleman, you are paying for the design and the ability to professional handle and care for your precious blossoms. It’s not only the flowers, but the art that you are purchasing. 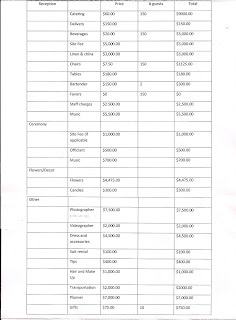 Here are some average prices that our Bride’s spend. 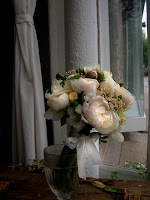 Of course, this is dependent upon the location, amount of flowers, and the designer. 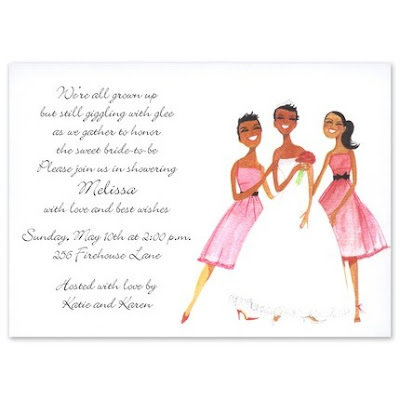 Invitations – I find this to be the most neglected area when our couples are planning their big day. What is the reasoning? Wedding guests throw them away? This, I don’t really understand, because it is from the invitation that your guests get the first impression of your wedding. 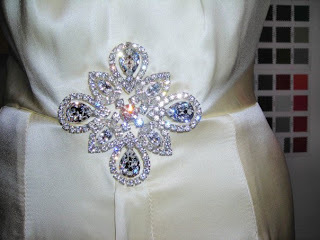 If you are having a black tie event, you want to give the impression of a very formal, sophisticated and elegant affair. 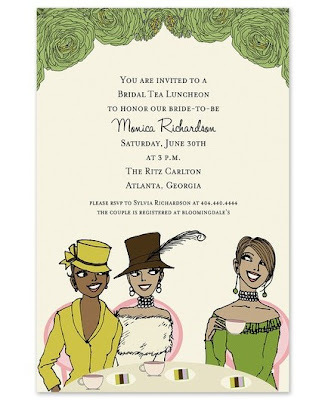 Your invitation might be engraved or letter-pressed, printed on high quality ecru paper. 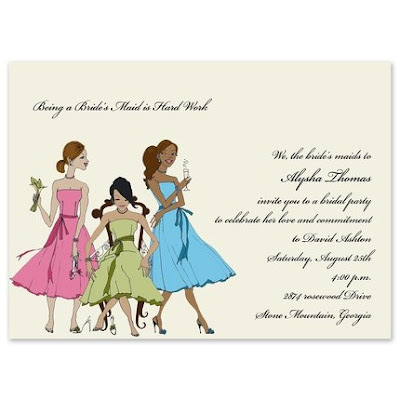 If you are having a backyard BBQ, than your invitation should say “fun” and “informal”. 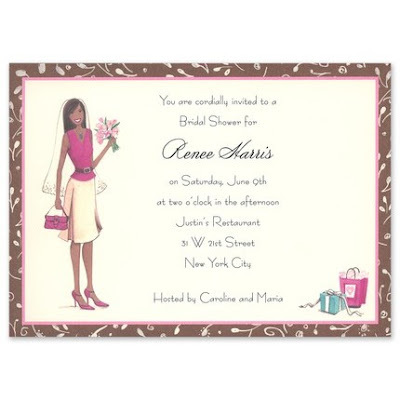 Invitation sets (invite, inner envelope, addressed outer envelope, reception, and response set) run $5.00-$20.00/invite depending upon the level of design and paper quality. I hope I have given you just a taste about how you should budget in a few areas. Next week, I will follow up with 3 sample budgets (5K, 40K, and 75K) budgets for 150 guests. If you know of another dynamic independent bridal designer, drop us an email to tell us about them at africanamericanbrides [at] gmail [dot] com! New month, new bride in the spotlight. Today we celebrate longtime message board participant natty_gyrl. 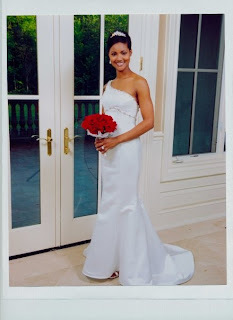 She and her groom had TWO ceremonies - one in Jamaica and one in the U.S. Read more about them on our homepage. 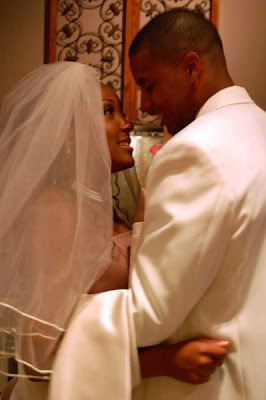 And if you would like to submit your wedding story, email us at africanamericanbrides [at] gmail.com. The Paper Knot is showing off snazzy new designs for its contemporary multicultural line. 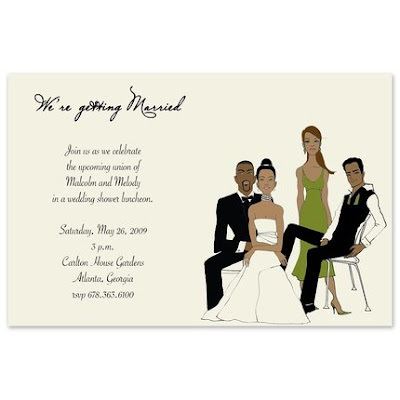 We love the cute, modern style of its wedding-related stationery. Take a look and let us know what you think.